Before last Wednesday, I’d never heard a fish sing — other than that annoying singing bass thing that everyone used to hang on their walls — and I’d definitely never heard one play a saxophone, flute, or upright bass. That all changed over the course of the next few hours. But first let’s back up to almost two years ago when a little music festival in Miami called Ultra was live streaming day one of the three day event. 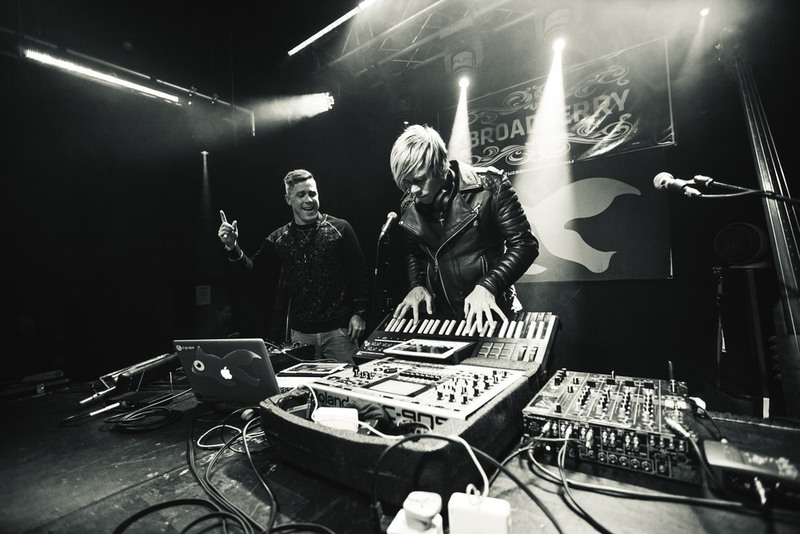 One of the very first acts on the broadcast was a duo from Cape Town, South Africa who absolutely blew my mind with their catchy and energetic mixing of electronic music with live instrumentation. Since then, you may have heard their songs “Fort Knox” and “Washing Over Me” in Kia Soul and Nike ads.The duo, comprised of Dominic Peters and David Poole, calls themselves Goldfish and last week they brought their unique sound to Richmond for the first time at The Broadberry. The night got off to a solid start when opening act Phil Dice brought a guitar on stage to solo over DJ Rometti’s mixing. Dice then proceeded to play a glitch hop infused remix of “Business Time” by Flight of the Conchords. The crowd appreciated their mix of danceable, feel-good tracks, and grooved along, stopping only to dodge the LED hula hoops that occasionally flew off of their spinning, twirling owners. At the end of their sets, the audience pushed in closer to the stage as the CDJs were cleared off and a table supporting an array of instruments, mixers, and trigger pads was pulled forwards. 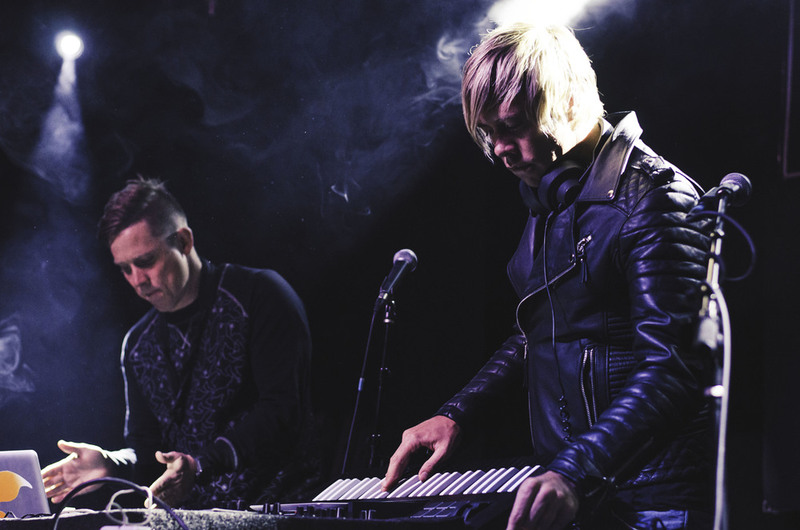 From the darkness, Peters and Poole emerged onto the stage, their hair bleached a salty blond from days spent surfing under the Cape Town sun. The first notes from the title track off their 5th studio album, Three Second Memory, began to play as Poole picked up his saxophone for the first of several blistering solos that night. “Three Second Memory,” which is both a reference to the band’s name and the disposable nature of the many trend following dance songs, set the tone for their set with it’s bouncing rhythm section and jazz-influenced instrumentation. Goldfish followed up with “One Million Views,” another upbeat song with lyrics that provide commentary on the increasingly repetitive state of dance music. 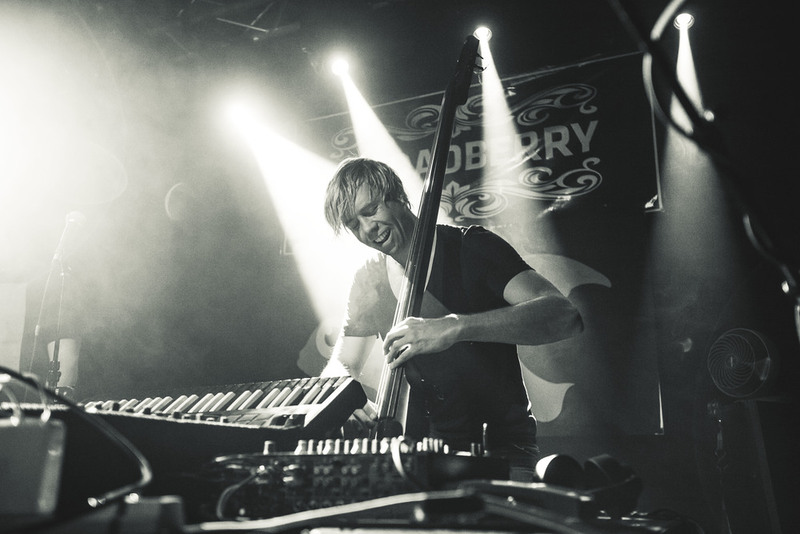 From 10:30 PM to 12:30 AM, Goldfish captivated the crowd at The Broadberry with a diverse range of originals and remixes, punctuated throughout by Pool’s soulful saxophone playing and Peter on keyboard and upright bass. One dedicated fan at the very front of the throng sang along perfectly in time with every line of every song, which was a remarkable feat considering he was simultaneously head banging for the better half of the set. At the end of the night, Pool and Peter stuck around to greet their dedicated fans and exchanged sweaty handshakes and hugs with the exhausted, but thoroughly pleased, crowd who chose to spend their Wednesday night with Goldfish.